The chatty room becomes silent as he enters the stage. Taking his place at the lectern and without much introduction or presentation, he starts his lecture as he has done hundreds of times before. It isn’t needed, the lecture is sold out and everyone in the audience knows who he is. Bringing books in hope they will be signed. Classic names like “The End of History” and “The Origins of Political Order” can be read on the spines. The silence among the listeners is almost numbing. No one whispers, nor shines the white light of a single phone flash. In this moment, only the 66-year-old political philosopher from Manhattan exists, in Oude Lutherse kerk Aula. The essence of Fukuyama’s speech, is that through our cultural diversity we must create a national identity, cast at the forge of liberal democracy. As the night progresses, this was the solution he kept returning to, during his speech and during the dialogue with the moderator. “National identity needs to be compatible with cultural diversity. Citizenship in a democracy must stem from values created by liberal enlightenment”, he said. What he says is fundamental and he manages to boil down this historically complex subject, into chewable, easy to understand explanations. What is striking though, is that Fukuyama may be preaching to the choir. The people who disagree with him but are still an important part of his argumentation, aren’t in the audience. The homogeneity is not because of demography. The hall is filled with people from different age groups and with different ethnicities. Instead, it is a homogeneity of ideas. His statements are met with wild applause and his jokes fill the room with laughter. When the evening is reaching its end, a young man asks Fukuyama: “What you say is important but after this lecture, we will all go home, smoke hashish and talk about how horrible those populist voters are. 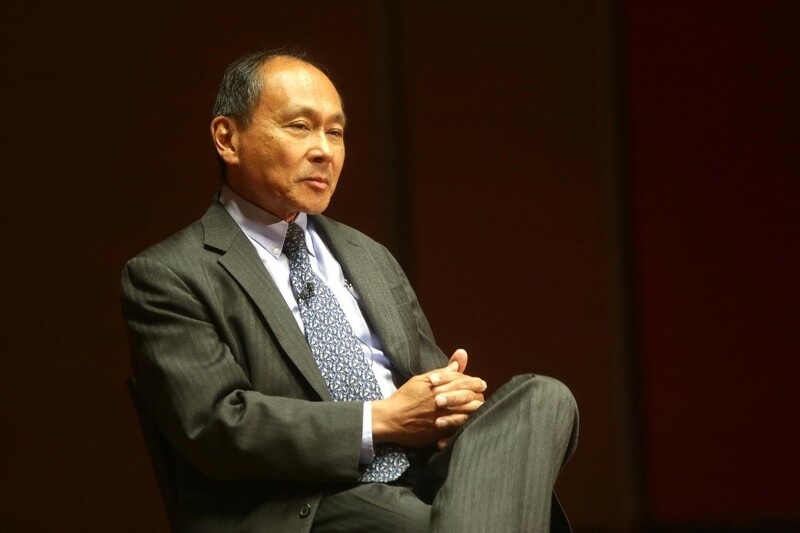 What can we do to change that?” To which Fukuyama replies, that we are simply forced to go outside our comfort zone and challenge our own identity. Even though the young man’s question evokes some chuckles, Fukuyama isn’t hesitant to answer it and he seems to be aware of this paradox. Earlier he talked about how intellectually enclosed a university can be and someone as stupid as a Marxist can only come from a university. The comment is met with laughter but for Fukuyama the joke could very well be a remark on his own audience. The moderator proclaims the evening has come to an end and “you can now get your books signed by Fukuyama”. Audience members rush to the table to get their newly bought copies of “Identity” signed and to shake hands with the professor. The atmosphere in the hall quickly changed from tranquil to turbulent and in the air a single question still rings: How many had their ideas challenged tonight and how many just wanted to see their intellectual idol? Next Next post: Pop stars falling from pedastal: how do we decide who we cancel?